Increase viability and light output with the Diode Dynamics Premium HID kit. 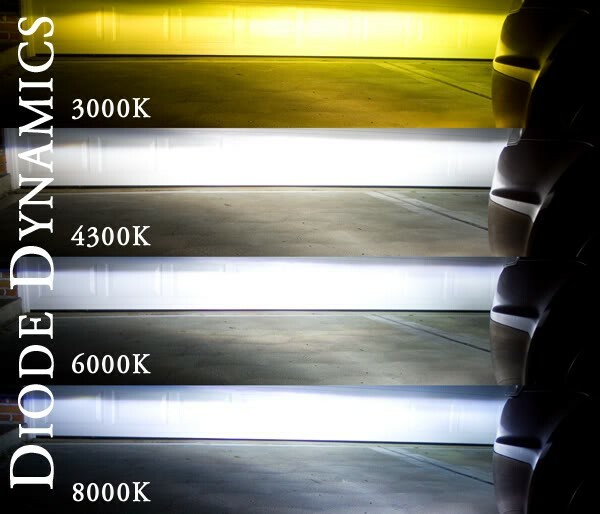 This Diode Dynamic HID kit includes a 3 year warranty. The CNLight bulb temperatures are rated accurately in correlated color temperature at 35 watts, and have an industry-standard 3000 hours of estimated bulb life. Please be aware that most HID bulbs are rated inaccurately from other manufacturers. 8000K is not dark blue, and 6000K is not pure white! We provide accurately-measured colors with a range of options to suit your taste. 5000K is a pure white output, without any warm hint, and no blue either. It may not be available in your specific bulb size, in which case it will not be shown as an option. 6000K is our most popular color, which produces an ice white color. It has a very slight hint of blue, and matches best with most LEDs.